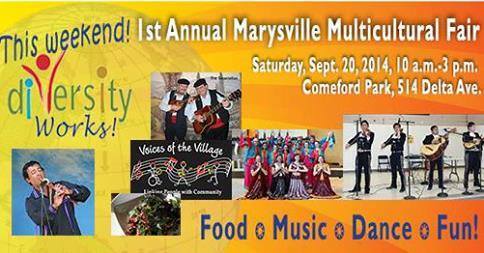 The City of Marysville, Mayor’s Diversity Advisory Committee and Marysville Arts Coalition invite you to the 1st Annual Marysville Multicultural Fair set for 10 a.m.-3 p.m. on Saturday, Sept. 20 in downtown Comeford Park, 514 Delta Ave.
Come celebrate diversity in the Marysville-Tulalip communities and the many cultures who call the area home. The multicultural fair is a free event for the entire family. Enjoy music and dance from around the world on stage in the Rotary Pavilion in Comeford Park. Experience traditions from other lands through demonstrations and displays. Enjoy the food court where exotic ethnic foods will be available for purchase, and explore artwork on display from our diversity arts contest coordinated by the Marysville Arts Coalition. Plenty of cultural resource and craft vendors, and hands-on activities for children. The Coalition will announce and display the winning entries from an all-ages diversity arts contest earlier this year. The multicultural fair is proudly sponsored by key sponsor Sea Mar Community Health Centers, HomeStreet Bank, Marysville/North County YMCA, Molina Healthcare and Marysville Free Methodist Church. Come one, come all “We are excited to offer this new event to bring hundreds of people together in a celebration of the many diverse nations, languages and cultures of the world through food, art, music and dance,” says Mayor Jon Nehring. Nehring established the Diversity Advisory Committee in 2010 to advise him and city government leaders on issues of diversity and inclusion. The Committee also includes representation from advocates of individuals with a physical or mental disability. Music and dance with Mi Pais mariachi band, Bollywood-style dance featuring Rhythms of India, The Tarantellas with songs of Italy, Voices of the Village, Native American flautist Peter Ali, Marysville Y Break-Dancers and Mexican youth dance in traditional wear. Native American storytellers, cultural resource vendors, food court with ethnic specialties for purchase, and diversity artwork on display. See www.marysvillewa.gov/multiculturalfair for more details. This entry was posted in Arts & Entertainment, Local News and tagged diversity, MARYSVILLE, Multicultural Fair, Tulalip by Kim Kalliber. Bookmark the permalink.